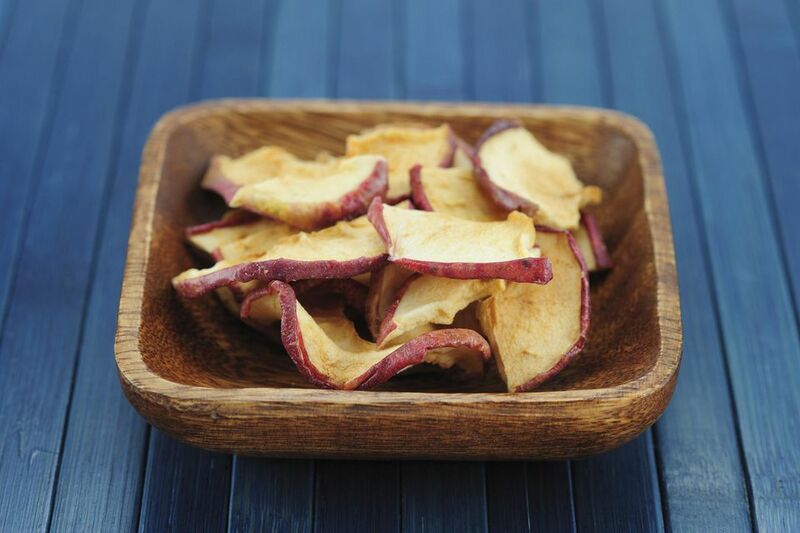 Dried apples are a tasty, portable and healthy snack, perfect for after school, in the lunchbox, or to curb that late morning or afternoon hunger. Keep in mind that the more flavorful and fresh the apples are, the more delicious the dehydrated version will be. You can use any type of apple you prefer. There are just a few steps to making oven-dried apples, but it does require several hours of time in a very low oven. Once you rinse the apples, you need to peel and core them. Use a vegetable peeler to remove the skin. Although you can skip this step if you're pressed for time, the peels will be sharp-edged and tough when dried. Next, cut out the cores. You can do this either with an apple corer or simply by slicing the apple into quarters and then cutting off the tough edge of each piece. Don't discard those peels and cores! Use them to make apple scrap vinegar, apple scrap jelly, and homemade apple pectin. Dried apples are best when sliced thinly. Using a sharp knife, cut the apples into slices that are approximately 1/4-inch thick. As you slice the apples, drop the pieces into acidulated water to prevent them from browning. You can make acidulated water by adding 1 1/2 tablespoons of vinegar or lemon juice to a quart of water. Leave the slices soaking in the acidulated water while you finish slicing the rest of your apples. Once all of the apples are sliced and have had a soak in the acidulated water, drain them in a colander. Let them sit in the colander for 2 to 3 minutes to drain off as much water as possible. If the apple pieces are too moist, they will steam instead of dry in the oven. In order for the apples to dehydrate properly, they need to be arranged in a particular way. Place cooling racks inside baking sheets and arrange the apples on the racks so that none of the slices are touching. Turn the oven to its lowest setting, which is usually between 140 F and 150 F. Prop the door of the oven open with the handle of a wooden spoon (this isn't necessary if you are using a convection oven). Put the baking sheets with the apples in the oven. Let the apples dry until they are leathery to crisp, which can take anywhere from 6 to 10 hours. If your oven is hotter in some spots than others, turn the baking sheets around occasionally so that the pieces dry evenly. You won't be completely sure if the apple pieces are fully dehydrated until they have cooled. (You know how cookies crisp up after you take them out of the oven? The same happens with dried fruit.) Remove the trays from the oven and let the apples cool on the trays for 20 minutes. After the cooling off period, tear one of the pieces of fruit in half. There should be no visible moisture along the surface of the break. If the apple is still soft, return to the oven for a bit longer. Even after the apples are correctly dehydrated there may still be some residual moisture in the fruit that you can't feel. This shouldn't be enough to prevent the fruit from being safely preserved and mold-free. But you'll have a tastier, better product if you do what is called "conditioning" the dried fruit. Put the dried, cooled apple slices into glass jars, only filling the jars about 2/3 full. Cover the jars and shake a couple of times a day for one week. This redistributes the fruit pieces as well as any moisture they may still contain. If any condensation shows up on the sides of the jars, your fruit isn't dried well enough yet and it needs to go back into the oven on its lowest setting for an hour or two. Once your dried apples are conditioned, store them in airtight containers away from direct light or heat. It's okay to fully fill the jars at this point; the 2/3 full was just for the conditioning phase when you needed to be able to shake the pieces around.